Liquid chiller systems allow the most flexibility in design. The benefits of a liquid chiller system include compact heat exchangers and high heat flux. A liquid chiller can provide focused heat transfer and is especially useful for applications where multiple heat sources generate significant heat and need to operate below ambient temperatures. Aspen has developed robust liquid chillers which are compact, use low cost parts, and frequently integrate directly into the user’s system. 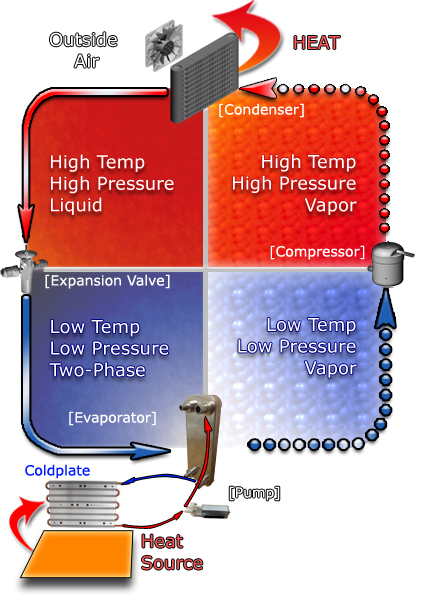 A liquid chiller system consists of the basic 4 components of a vapor compression refrigeration system: a compressor, a condenser, an expansion valve, and an evaporator. In a liquid chiller system, the evaporator is typically a compact refrigerant-to-coolant heat exchanger in which the refrigerant absorbs heat from the fluid. A pump is used to circulate the coolant through the heat exchanger and tubing or piping is necessary to connect the cooling “engine” (the refrigeration system) to a cold plate. The cold plate absorbs heat from the payload. The figure below demonstrates the details of a vapor compression cycle for a liquid chiller system. Aspen has designed and delivered many liquid chiller systems; both complete systems with cold plates and systems which integrate into our customer’s heat exchangers. Liquid chillers using Aspen’s technology offer high heat flux, high cooling capacity, and the highest flexibility for the customer’s application.